Ecuador offers the great possibility to climb all year round, anyway, the best climbing seasons are considered to be July to September and December-January. The weather during these months is drier as usual, and one can expect more clear days as the rest of the year. But, it is important to mention that the climate in general has changed significantly in the last years. Short rainy periods come unexpectedly during the “summer” or dry months. And hot and windy weather can be present when rain showers are supposed to come. The weather in Ecuador changes so quickly due to its location, close to the humid Amazon jungle. However, the conditions in the mountains are mostly acceptable to climb, being the humidity and moderate wind storms the two of the most common inconveniences. More important than the time of the year is the time of day you climb. You should reach the summit of any of the snowcapped peaks before 8 a.m. so that descent is completed well before midday. As the snow is warmed by the sun, avalanches are far more likely. On top of this, any rock held in place by ice will start its gravity-induced downward journey once the sun has melted the cementing ice. Nights and early mornings are generally clear, clouds normally come in by midday, this is another reason to climb at night. The weather tends to be better at full moon. Most of the Ecuadorian five-thousanders have snow and glaciers. Although the glaciers recede at a worrying velocity, they are, fortunately, still present on Chimborazo, Cotopaxi, Antizana, Cayambe, Iliniza Sur, Sangay and Altar. Climbs to these mountains through normal routes involve cramponing on moderately steep slopes (40-55 degrees) and a great deal of glacier travel. 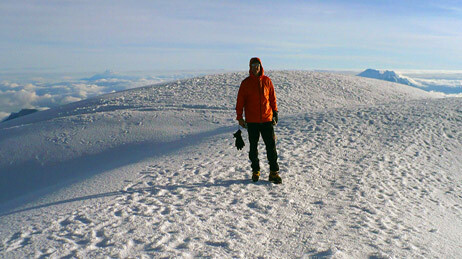 Prior knowledge of ice axe arrest, 10 and 12-point cramponing and rope team travel are REQUIRED. Everyone must have these climbing skills. You will also need a sleeping bag for the huts (there are mattresses), and additional camping supplies if you will climb Antizana, Sangay or Altar (equipment is often included in our prices, but please double check). Most technical and group equipment, such as: ropes, ascenders, snow pickets, ice screws, etc., will be provided if you travel with our guides. Altar is the most difficult mountain in Ecuador, it contains various routes considered amongst the hardest in the world. A complete set of technical equipment is required, and the skills of the climber should be absolutely excellent! The smaller Ecuadorian mountains, such as: Pasochoa, Pichinchas, Imbabura, Cotacachi, Fuya-Fuya, Mojanda, Rumiñahui, Corazon, Sincholagua, Iliniza Norte, among others, will require good trekking boots and waterproof/ windproof clothing for trekking. Please contact us if you are unsure about the equipment to bring. We'll send you a complete list according to your itinerary. Acclimatisation is the process that an individual follows in order to prevent altitude sickness. It occurs when you ascend to high elevation quickly. The best way to prevent altitude sickness is to spend a day or two traveling slowly to high altitude, so you will allow your body to gradually adjust. 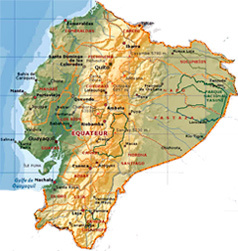 Even though Quito is at 2850 meters above sea level, it is still considered relatively low. Most travelers experience no more than some shortness of breath and mild headache which dissapears within few hours. However, if you travel higher than Quito you may experience more severe symptoms such as: loss of appetite, vomiting, fatigue, insomnia and a fast and irregular pulse, which is known as AMS (Acute Mountain Sickness). Considering that the Andes is the world's second highest range (many of its peaks are above 6000meters) and your plan is to climb them, it is recommended to spend 2-3 nights at an elevation of 3000 meters; this way your body will get in a better shape and ready to the high altitude activities ahead to come. For instance, Quito is considered one of the best places to start an acclimatisation process. Besides hanging out in the city, there are many activities that you can do in the surroundings, such as: daily hikes, treks, mountain biking, climbs to low elevation peaks, or just visiting local Andean Indigenous communities in the highlands. Some nights at 4000 m will help your body to reach higher elevations even above 6000m, but it will depend on your good physical condition as well. Another key factor for a good acclimatization process is to be well hydrated. In Ecuador tap water is ok but is much better and recommended to drink bottled water. Once the acclimatisation process takes place, the probability of AMS is almost gone, and all outdoor activities in the Andean range become easier, safer and more enjoyable. -	Do not walk home late at night, take a taxi. -	Avoid dark, desolate streets or go with your guide if you would like to explore the town. -	Watch your camera and backpack in busy markets. -	Leave your passport and valuables at the hotel´s safe box. -	Try to carry only the necessary amount of money that you consider. All of these precautions are the same that a person would observe in any city anywhere. Travelling in rural areas in the Andes is safer. For us, your personal safety is our greatest concern. Expert guides, quality equipment and well-researched itineraries are the basis of our adventures. For any of the adventure trips we highly recommend to purchase personal-full coverage travel insurance.